There is a quiet revolution that is radically reshaping the Muslim world: 50 million women have entered the workforce and are upending their countries' economies and societies. Across the Muslim world, ever greater numbers of women are going to work. In the span of just over a decade, millions have joined the workforce, giving them more earning and purchasing power and greater autonomy. 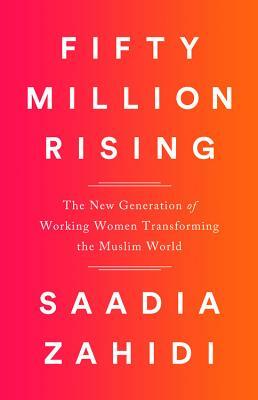 In Fifty Million Rising, award-winning economist Saadia Zahidi illuminates this discreet but momentous revolution through the stories of the remarkable women who are at the forefront of this shift--a McDonald's worker in Pakistan who has climbed the ranks to manager; the founder of an online modest fashion startup in Indonesia; a widow in Cairo who runs a catering business with her daughter, against her son's wishes; and an executive in a Saudi corporation who is altering the culture of her workplace; among many others. These women are challenging familial and social conventions, as well as compelling businesses to cater to women as both workers and consumers. More importantly, they are gaining the economic power that will upend entrenched cultural norms, re-shape how women are viewed in the Muslim world and elsewhere, and change the mindset of the next generation. Inspiring and deeply reported, Fifty Million Rising is a uniquely insightful portrait of a seismic shift with global significance, as Muslim women worldwide claim a seat at the table. Saadia Zahidi is head of Education, Gender and Work and a member of the Executive Committee at the World Economic Forum. She is a founder and coauthor of the WEF's Global Gender Gap, Human Capital and Future of Jobs reports. In 2013 and 2014, she was named one of BBC's 100 Women driving change in economics, politics, and society. She is the recipient of the FT/McKinsey Bracken Brower Prize, promoting young authors writing on emerging business themes, for this book.